Rather than a washout, its been a sticky weekend. Dewpoints have been in the mid to upper 60's. The last two Sunday's have been fall like but today will be a summer like day. Temperatures will climb into the upper 70's and dewpoints will remain in the mid 60's. The question most people want to know is when will the humidity break? Unfortunately the uncomfortable conditions will remain in the region until Friday. By the weekend temperatures will be in the lower 60's so relief is on the way. 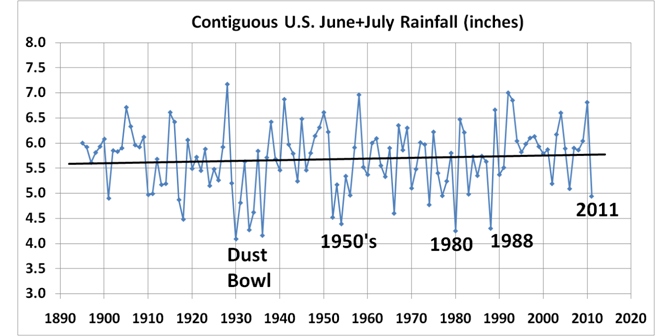 So what is causing this summer like pattern? A upper level low pressure area has dropped out of the pattern. In a low pressure area winds blow counter clockwise. That means that our wind direction is from the south and with a southerly wind comes moist tropical air. A stalled frontal boundary remains just offshore. Originally it looked like that boundary would be onshore and that's why the forecasts for this weekend turned out to be incorrect. Its going to take awhile for this disturbance to move. It's called a "cut off" low pressure center because it has become "cut off" from the rest of the pattern. The atmosphere behaves (is) as a fluid and moves in wave like patterns. These waves are not able to push this system out. Eventually (Friday) this will get kicked out but the forecast is tricky in regard to timing. This is good news for us, but not so much for New York and Pennsylvania who are still recovering from Hurricane Irene and Tropical Storm Lee. Tomorrow is going to be a nice summer like day. There is a slight chance of showers early. Fog will be an issue for the commute but after it burns off temperatures will soar to the low 80's. Tuesday morning will also be foggy. Tuesday will be mostly cloudy but the sun will peak out and some area's will have a decent afternoon. By Wednesday rain will approach the region as the upper level low begins to move east. Timing is up in the air as the models are not in agreement. In the long range forecast some early season cold weather is likely 10-14 days out or so. Two Tropical Storms are currently active in the Atlantic Ocean Basin. These are the 15th and 16th Tropical cyclones. However, there have been only 3 Hurricanes. One of these two (Philippe) may become the 4th Hurricane but both systems ultimately will head out to sea. I expect an active October so the Hurricane numbers will pick up. The system will slowly creep towards the Atlantic coast. The humidity is rough with this because of the tropical moisture it contains. So for details...a constant threat of showers and thunderstorms for the next 72-96 hours. Weather tomorrow will be the worst as over 2 inches of rain could fall. Temperatures will creep into the mid 70's, but you will still need an umbrella or a rain coat. Here is the rainfall forecast for the next 5 days. Unfortunately this fits the climatology of years like this and it appears we will be in for a wet fall. I started a new job this week so I took some time off from the blog to get adjusted and settled on a schedule. After some early week humidity fall came rushing in yesterday. At Worcester Airport (elevation roughly 1000 ft) high temperatures did not make it out of the 50's yesterday, stalling at 59. Here in the Blackstone Valley temperatures were able to climb to the mid 60's. Today will be more of the same, lots of sun but the north wind will only allow temperatures to creep into the mid 60's. Tonight mainly clear skies will allow temperatures to again drop into the mid 40's. Some high clouds may develop to keep temperatures a little higher than last night. This morning's low at Worcester airport was 44. By comparison Smithfield, RI dropped to 41 this morning. This is unseasonably cold weather this early in the season. Technically, we are still in summer. In the world of meteorology however, fall begins September 1st. In our little world winter begins on December 1, spring on March 1, and summer on June 1. Tomorrow will continue the trend of temperatures in the 60's. Highs will be in the mid to upper 60s's. The skies will be sunny so no weather problems for the Pats home opener. The weather will be great for fans to get "all lubed up" as Brady suggested during the week. Lows for Sunday night will again be in the mid 40's. Monday is a repeat of Sunday. By Monday night, a system moving offshore may bring some showers to the area. If this misses we're looking at the dry spell continuing until Thursday/Friday range. Temperatures return to the 70's for Tuesday through Thursday because High pressure will build in. 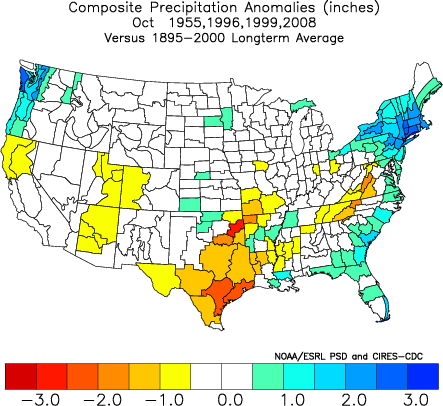 The Northeast does not need any heavy rain events so we will take any dry spell we can get. Hurricane Maria made landfall on the southeast Newfoundland coast yesterday afternoon. The storm was moving 54 mph with winds of 75 mph. Hopefully the Christmas trees all survived or that will be another expense this winter. As of night now there is only one area to watch in the Atlantic and that is off the African coast. The National Hurricane Center gives this disturbance a 30% chance of developing within the next 48 hours. Most models are developing the system slowly, taking it west north west generally towards to the islands. I will say this however, most storms that form as far east as this system usually go out to sea. The exception is Hurricane Donna of 1960 which brought Hurricane conditions to every state on the east coast. That's a record that is unmatched in recorded history. I think this system develops and becomes Ophelia. I'm using the same analogs as I used for Hurricane season because they helped correctly predict an East Coast Hurricane landfall this year, specifically North Carolina. These maps are courtesy of NOAA's Physical Science Division of the Earth System Research Lab. To me it looks like the Jet Stream is going to set up a ridge over the West and a trough in the east. This keeps the east coast in play for October tropical cyclone weather. If this continues into winter...well that's a post for another day. I've got Oakland, 17-16. The Raiders defensive front is much more formidable than the Kansas City Chiefs. Seymour and co. make it difficult on Fitzpatrick in the red area and Oakland ekes out an impressive road victory. Packers 38-17. Aaron Rodgers will have his way with the Panthers secondary, while Newton faces the defending champion defense instead of an NFC West one. Baltimore 34-20. If Baltimore is as good as I think they are, they avoid the letdown against the Titans. Jets 27-6. Even though Tony Romo threw for over 300 on Rex's defense, this is Luke McCown starting on the road. Jets D will be impressive and Sanchez will be sharp against the Jags defense. Washington 31-21. Rex Grossman should have a good day against an Arizona team coming to the east coast for a 1 PM game. The Cardinals gave up 422 yards to Cam Newton in his first career start after the lockout. Kolb will be okay, but the Skins D appears improved. Steelers 41-14. A rematch of Super Bowl XL. Another nightmare for the Seahawks. Give the Steelers a week 1 mulligan. 49ers 21-17. Panic time in big D and a premature crowning of Jim Harbaugh as the next great coach. I don't really trust Tony Romo to respond until he proves otherwise. The 49ers have good players and I do think Jim is a better coach than Singletary. Dallas will be fine but it will wait until the home opener against the Skins next week. Denver 34-7. I think Orton will respond. The Browns had the Bengals outplayed last week, then the Bengals have to pull a trick play. This week on the road in a tough place to play the Bengals will struggle to move the football against a decent Bronco's defense. Texans 33-21. Houston won't be affected by the Heat and humidity in South Florida. Houston just experienced one of their hottest summers on record. After the exhaustion suffered by the Miami defense on Monday night, I think Houston will speed up the game and pull away in this one. Henne will be good, but with Mario Williams coming at him he will have less time to throw. Careful with kickers in this one, winds could create a problem. Patriots 35-28. The Patriots offense is just to fast. Tom Brady has entered the Pedro Martinez zone. That's where you have to watch every game he starts because NFL history could happen. Pedro was the same way. San Diego will throw to keep up, inflating passing numbers. The key will be 3rd down. So besides Miami-Houston there doesn't appear to be any weather issues for tomorrow's games. So set your fantasy lineups accordingly. Nothing to say today. Enjoy football and never forget all of those we lost. The forecast calls for the river to rise almost to flood stage; I think it comes over its banks and crests around 10 feet, just like during Irene. This is something to watch throughout the fall. 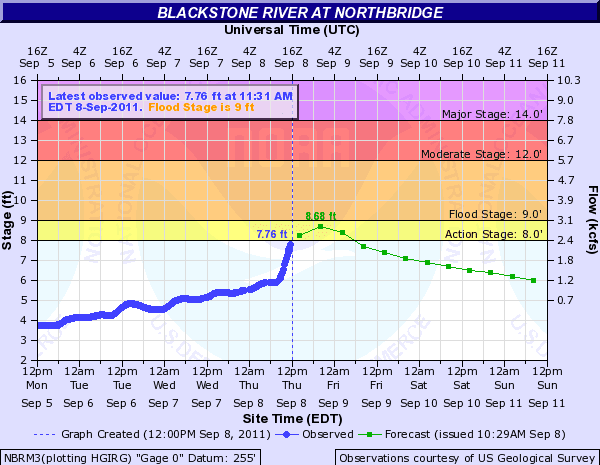 I wouldn't be surprised to see a top 5 flooding event in Northbridge during the fall. 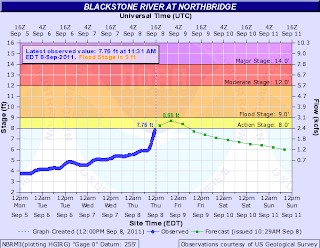 Home and business owners along the Blackstone should be ready to evacuate; a flooding event like 2005 is not out of the question. The good news is that most of the rain is over and tomorrow will be a nice day. Hurricane Katia will be making its closest approach on Friday. A high surf warning is in effect for south facing beaches. Waves will be 4-10 feet, the highest on the Cape and Islands. Dangerous rip currents will also make swimming a bad idea so lets stay out of the water. Anyway tomorrow starts off with dense fog, burning off by 11 and leaving a nice day. Temperatures will soar into the low 80's. The high school football games should be fine, a nice opening night in which a light jacket is all you will need. Mainly clear skies with temperatures in the mid 60's throughout the game. On Saturday I expect morning rain to end by about 10 am and the rest of Saturday should be okay. However the day may be gray and temperatures will struggle to get out of the low 70's. Saturday night the fall chill will be in the air as temperatures drop into the lower 50's. I would expect all the coolest locations to drop into the upper 40's. You'll notice on Sunday because despite party sunny skies, temperatures will struggle to reach 70. 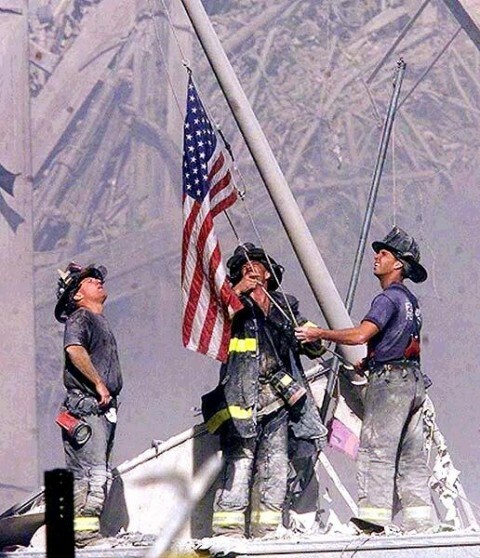 It will be a great start to the NFL season and weather just like the morning of 9/11. 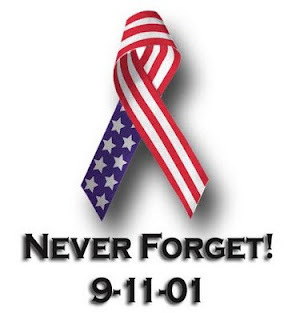 I can't believe its been 10 years, that day feels like yesterday. Maria will pass by tomorrow. Maria looks like its heading on a starting pass very similar to Irene. Several factors should limit Maria if she survives the wind shear she is currently facing. The official NHC forecast and track takes Maria to the threshold of hurricane strength. 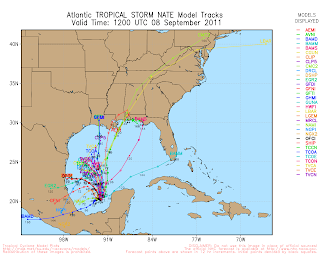 Nate may actually bring some rain to Texas after all. He is going to sit around, become a Hurricane and make up his mind. That's all for now, I wanted to focus on our weather today. More later. I want to apologize to those expecting updates over the last few days. 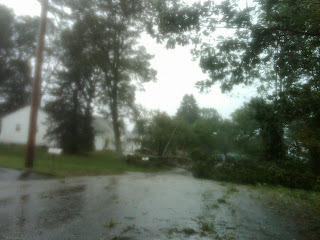 My internet has been going on and off ever since Hurricane Irene so it has been difficult to post. Hopefully that is all squared away; I missed a fantasy football draft last night because of it. Anyway on to the weather...which has been dreary. The remains of Tropical Storm Lee have combined with a frontal boundary and together the systems have been dropping heavy rain over areas that do not need it. The heaviest rain has appeared to shut off for Southern New England. That will not put us out of the woods; showers are still likely from now until Friday night. The remnant circulation of Tropical Storm Lee will continue to push northeast and there will be another chance of heavy steady rain Friday night into Saturday morning from the interaction of Lee and Hurricane Katia passing well offshore of Nantucket. Until Friday night there is a good chance the lulls in between rain will produce manageable weather. I actually expect tomorrow to be a pretty decent day with very little rain. Tonight we may have to deal with isolated heavy rain bands from Hurricane Katia. 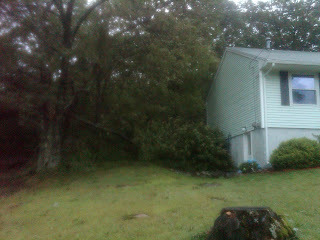 Remember Saturday afternoon before Irene? Those were predecessor rain bands and some models are hinting at this happening with Katia as well. The only other effects from Katia will be dangerous surf and rip currents. Stay out of the water this weekend, it only puts other people at risk when they need to come save your life. Unless you are an experienced surfer don't even bother going in. For the weekend, most of Saturday and all of Sunday look to be great here in New England. The NFL kicks off this weekend, if you pick games (for fun of course) I'll be forecasting each game. A special Green Bay forecast will be available later tonight and a full forecast for the other 15 games will be available Friday. The tropics discussion will follow below. Currently in the Atlantic Ocean basin there are two named storms and a third area that has a 60% of developing into a Tropical cyclone in the next 48 hours. First off is Hurricane Katia. Hurricane Katia took a textbook track north of the islands and in between Bermuda and the United States. The winds are currently 85 mph and the central pressure is 976 mb. While Hurricane Katia peaked with winds of 135 mph, a category 4 hurricane on the outdated Saffir-Simpson scale, Irene had a lower central pressure and thus is still considered the strongest storm of the season. The track of Katia will send her racing through the graveyard of the North Atlantic towards the British Isles. The extra tropical Katia will lash Northern Ireland and Scotland with powerful winds and rains in about 5 days. Here is the Hurricane Center track. Next up is newly formed Tropical Storm Maria. Maria is another system that has developed from a wave off of Africa. The official forecast for Maria calls for only gradual strengthening as she heads west towards the Northern Leeward Islands, a track very similar to Irene. I buy the slow strengthening of the system because that fits what each system has done so far in 2011 and it fits the climatology of a warm AMO/double La Nina season. In 2010 most systems rapidly strengthened as they moved off Africa and were controlled by large scale steering features that took the storms out to sea. Development has been much closer to land in 2011. I see Maria as a possible threat to the United States in 7-10 days. I'm much more concerned for Maria than I ever was for Katia. Here is the NHC track for Maria. 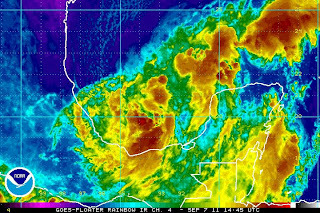 Finally, convection in the Bay of Campeche associated with an old frontal boundary has been firing consistently over very warm waters. Currently the upper air pattern is not all the favorable for development as upper level shear as well as dry air is limiting the organization of the system. None the less there is a high chance this system becomes a Tropical Depression and then Tropical Storm Nate. Some of us may have to call it Tropical Storm Teeks (or Torch). The bad news for this system is that the model spread is taking it into southern Mexico or the Northern Gulf Coast. Not one is taking it into Texas where it needs to go. I hope it heads that way, the fires and drought are terrible for those folks. 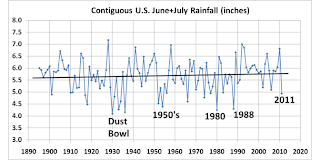 Its just like the 1950's, when a 10 year drought severely damaged the Texas region. Another problem with the system is that if it does head towards the northern Gulf Coast, flooding is going to be a huge problem. Lee dropped copious amounts of rain in the Southeast. This is not what they need at all. Yes I realize this is only June and July, but data for August is still incomplete. 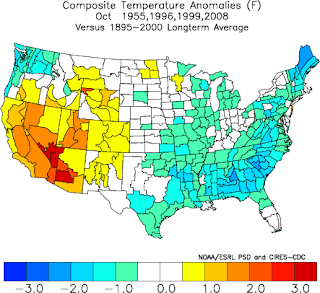 I am not arguing that we haven't seen extreme weather events in 2011. We certainly have, but they aren't unprecedented. The Earth's temperature dropped nearly a full degree in the mid layers from 2010 to 2011. The lower troposphere also cooled. That type of atmospheric cooling is going to allow for more water vapor and cloud formation due more mixing of warm and cool air masses. The same thing happened in the 1950's. I'm really sick of every weather event being blamed on "global warming". What the hell caused all the awful storms before the Industrial Revolution? After 106 hours, power was restored to my neighborhood last night. That is the longest I've ever been without power and it brought up an interesting question. Would you rather face a Hurricane like Irene or a winter nor'easter? Most people answered a Hurricane because there was nothing to shovel and the weather was warm so no one had to leave their home. I actually cringe when I hear that response because Irene was nowhere near the strongest winds we could face in a hurricane. Structural damage was limited to trees falling on homes. In a category 1 or 2 hurricane there would be more damage to homes and businesses and people would be without power for longer. I see government officials are complaining about the long process of getting power restored. Its a natural disaster that hit nearly the entire east coast. Crews have been brought in from Michigan and Canada. There were just too many trees down for a rapid response. It does get old and frustrating sitting without power but the utility crews are working 16 hour shifts and working as fast as they can. Scenes like these played out all over the commonwealth. Now a lot of people want to know where Katia will go. More on Katia and Lee in the tropics discussion below. The weather for today and tomorrow is awesome for the start of Labor Day weekend. Highs today will reach the lower 80's with mostly sunny skies. Tonight is nice with temperatures dipping into only the lower 60's. For September that's not bad at all. Tomorrow will be nice, a transition day of sorts. By late in the day some areas north and west will have a slight chance of a thunderstorm as a cold front approaches on Sunday. Highs remain in the low 80's. Sunday and Monday will feature a thunderstorm threat, but as of now it looks like scattered showers is most likely. Some areas will see thunderstorms and some will not, the details on who gets what will be worked out later today and tomorrow. Katia should ride along the ridge for the next 5 days. With more model information we'll be able to narrow down the track and be more specific. The storm will re-curve somewhere between Bermuda and the east coast, the question is where, when, and how strong. Hurricane Katia is moving west north west towards the Leeward Islands. The storm will likely move north of the islands and head northwest somewhere between Bermuda and the east coast. Its looking like Katia will be pushed away from the east coast with the greatest threat for Atlantic Canada. 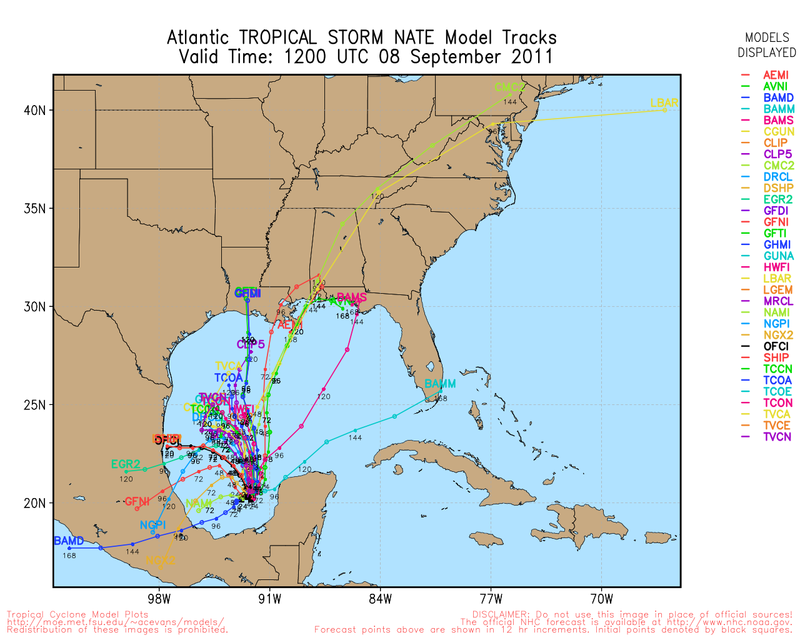 This could change, but the forecast is calling for a midwest trough to kick Katia away. This would allow for the system that will become Lee to move northward into the Tennessee Valley. This could potentially be bad news for the northeast as areas hit hard by Irene's flooding may see more heavy rain. Lee will likely be a Hurricane before moving into Louisiana. Rain will return by Saturday night with a chance of showers. Hopefully everyone's power will be back by then. Utility crews are finally working on the trees and power lines in my neighborhood so I hope to be back online with pictures of the storm and updates on Katia and Lee.